Whose Mystique Was Greater: Hogan’s or Merion’s? The answer, as usual, is yes and no. The Cal Sci algorithm is rigorously scientific, so it can’t be “influenced” — if by influence you mean subtle bias in favor of a region, a certain architect or an old college friend who has snapshots of you in a compromising position with donuts. On the other hand, the algorithm recognizes “media exposure over time” as a critical variable in measuring course quality. The par-3 sixteenth hole at Cypress Point has appeared on hundreds of book and magazine covers, while the par-3 ninth at Ft. Meade (Fla.) City Mobile Home Park Golf Course has appeared on none. Maybe that reflects an unavoidable social-class bias, but I still infer from the lopsided coverage that the California course is by far the better track. That’s one reason, but not the only reason, why exclusive Cypress Point is currently our 13th-ranked course. Similarly, our placement of the equally-private Merion East at No. 36 is supported by David Barrett’s new book, Miracle at Merion: The Inspiring Story of Ben Hogan’s Amazing Comeback and Victory at the 1950 U.S. Open. Most of Barrett’s compelling prose is dedicated to Hogan and his dogged opponents, but the book is nevertheless a must for golf-design nuts or, for that matter, anyone who owns both a wing chair and a persimmon driver. *Merion’s altitude, according to The Rolex World’s Top 1000 Golf Courses, is a mere 351 feet. But David may have been speaking figuratively. *Hogan’s Sunday playoff with George Fazio and Lloyd Mangrum didn’t start until 2 p.m. because of Pennsylvania’s blue laws. 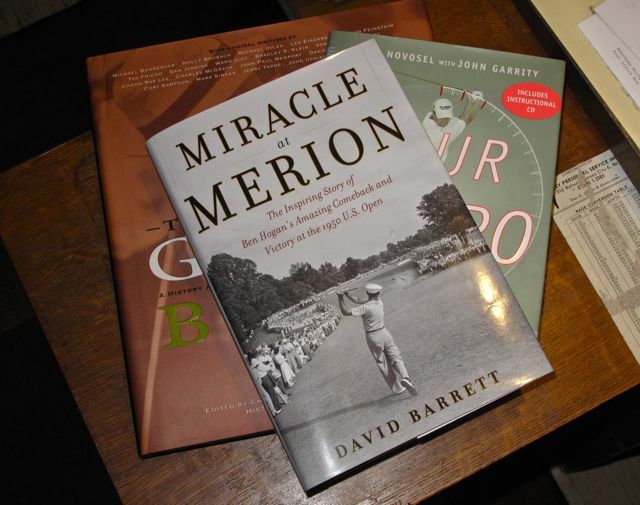 Miracle at Merion, from Skyhorse Publishing, is $24.95 at bookstores. Ticket prices for the 2013 U.S. Open at Merion East have not been announced by the USGA, there being no way to predict if there will be another miracle.